And many other honorable descriptors and codes of ethics these old Okinawan Masters were reputed to have ... in short impeccable integrity, they would not lie! 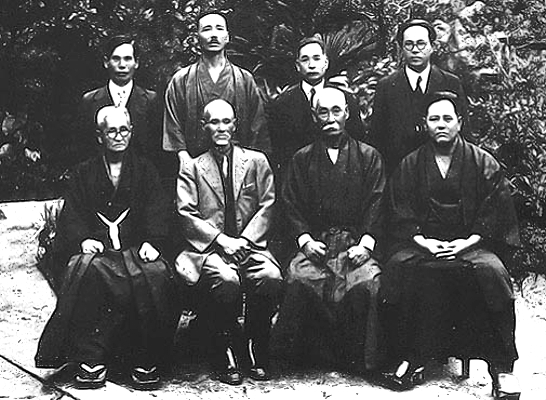 Founding Eminent Okinawan Karate Masters of "Karatedo" Association in 1936. So when they further developed Karate and the Kyusho within, why do people of modern times not believe them and what they said, wrote and depicted in many images? We have the writings of so many, both known and anonymous Martial Masters, that clearly define Vital (Kyusho) Targets, that few take nottice of. This is a dichotomy of the Martial Arts, whereas the Martial Artist tries to live by a code of ethics drawn by these great leaders of old, yet they do not work with the guidelines they laid out for training in their writings or documents... Example being, Kyusho. This is a personal choice to ignore the one side of their teachings while revering the other, but one thing for certain was that each generation got further removed from the substance of their Martial Art, as they turned to the appearance or performance. We can not tell what specific nerve the instructor is targeting in this image, but we can tell you it is a specific target by the use of the hand position. 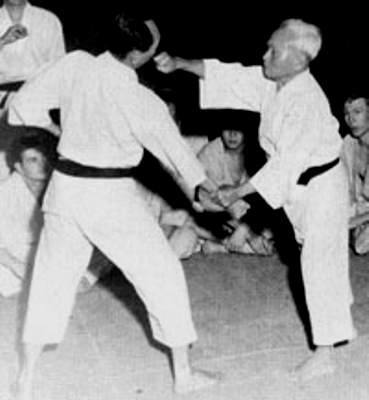 Gichin Funakoshi added Kyusho notes in one of his more famous books as well to aid the reader, this was no filler or accident, it was deliberately added as historical record for future generations and the intergrity of his Art. 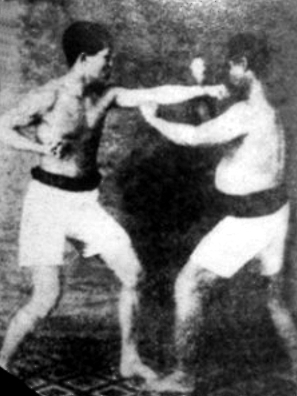 You may get away with telling a story in a face to face scenario (not that they did or would), but no one would ever have put it in a book back then as it would be a document far exceeding their life time as was the case for Funakoshi. The Notes, manuals, scrolls and books many highly renowned instructors contained Kyusho targets, they were all over the body not just the limited areas mentioned in this writing. As example; we can see here that the nerves of the arm are being attacked, working the Ulna and Median nerves. Why would Choki Motobu (pictured here), have taken this photograph to out live himself if it were a hoax or incorrect method? We all know eyes. ears, nose, throat, groin, temple.... but there was far more in the teachings, yet ignored by most. 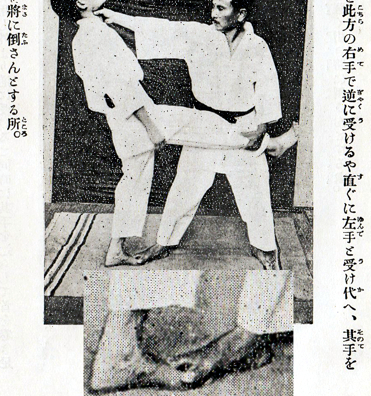 As we see in this image, the throat is not being grabbed, instead the thumb is exerting pressure on the nerve of the neck as the foot is digging into the nerve of the opponents foot. So why don't modern Martial Artists respect these great legends as well as what they wrote? Back even when this author was a child, character was far more revered and honored as it is now. No one would purposefully add incorrect information, they did however want to document what they knew, even if not spelled out. They also believed fully in the work ethic, so that each must work hard to find the truth from their own perspective.